Can I tell you the truth? In strict confidence, if you don't mind. I'm not actually that fond of everyday chocolate cake. I'd rather have a wedge of freshly made sponge instead. 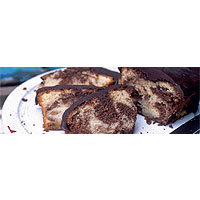 But I do like chocolate, and when it's done properly – that is, swirled casually together – marble cake seems to me the best of both worlds. Here I've used a variation on a pound cake for the basic cake, kept moist with a few ground almonds. Although it is good served plain, what cake isn't even more irresistible with chocolate icing splurged over it? Preheat the oven to 180°C, gas mark 4. Sift the flour with the baking powder and a pinch of salt. Grease a 19cm x 8cm x 6cm (454g) loaf tin and line the base. Melt the chocolate over a pan of gently simmering water, or in the microwave. Cream the butter and the sugar until light and fluffy. Beat in the first egg, then half the flour and 1 tbsp milk. Repeat, then fold in the ground almonds and enough milk to give a thick dropping consistency. Put half the batter in a separate bowl and stir in the melted chocolate. Now drop alternating spoonfuls of the two mixtures into the tin. Draw a sharp knife through the duo of mixes, swirling them into marbled patterns. Bake for 35–40 minutes until firm to the touch. Test by plunging a skewer into the centre – if it comes out clean, it's ready. Let the cake sit in its tin for 5 minutes, then turn out onto a rack to finish cooling. To make the icing, melt the plain chocolate with the butter and cream in a pan over simmering water, or in the microwave. Stir together, then leave to cool until it begins to thicken. Spoon over the cake and spread out smoothly, allowing the excess to trickle seductively down the sides. To ring the changes, try this with a tawny port. The long spell in oak gives the wine a symbiotic toffee and caramel flavour.